Kids can eat FREE at over 120 restaurants in Orlando! Meal costs almost always rack up quickly while you’re on vacation, which is why our guests love being able to cook at home in our full-size kitchens. But if you decide to eat out, you can keep on saving with our Kids Eat Free discount card, one of the best Orlando meal deals around! Reduce the amount of budgeting you need to do while on vacation and SAVE with this fabulous card. For just $15 per child, your children can eat free at any one of over 120 participating restaurants in the Orlando area. In each of the restaurants, you will need to purchase an adult meal at the same time. 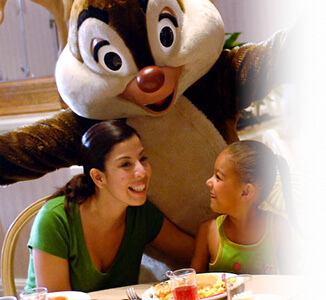 Think about it: an average children’s plate costs around $9 in the Walt Disney World® area. If a family with two children eats out once per day for a week, that’s nearly $150 SAVINGS – just in children’s meal expenses! With our Kids Eat Free discount card, you only spend $30, no matter how many times you eat out! *Please note: Offer only applies to children 11 years of age or younger. Limit (1) free meal per paid adult meal.